Robo from Dekaranger. 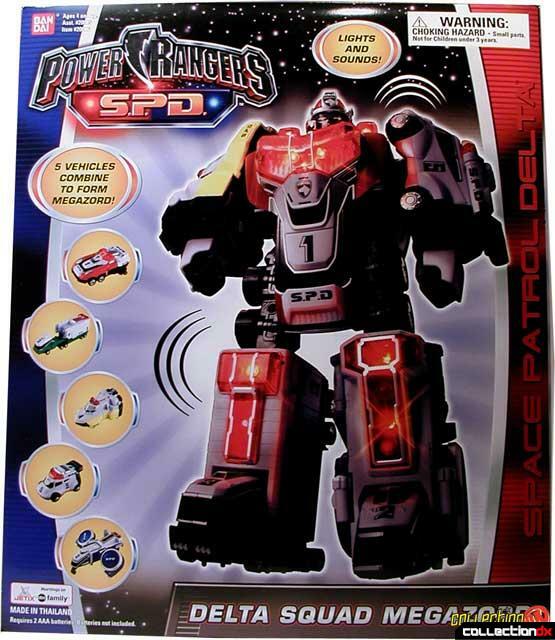 It is the first big Megazord released as part of Power Rangers SPD It features full combining action, lights and sounds, and many cool gimmicks. Each Delta Runner has an action feature. The Red Delta Runner makes up the main body of the Delta Squad Megazord. Turn the red switch on the bottom to the ON position and press the hood to make lights and sound activate. The back rear panels also fold out to reveal mechanical arms. The Green Delta Runner is a semi-truck, that features a slide out panel that holds the Judgment Sword and Signal Cannon. Green Delta Runner becomes the right leg of the Delta Squad Megazord. The Blue Delta Runner is a kind of helicopter, with a grappling hook that folds out from the bottom. The wings can be turned all the way around. Blue Delta Runner becomes the left leg of the Delta Squad Megazord. The Yellow Delta Runner becomes the right arm of Delta Squad Megazord. This vehicle stores the base of the Judgment Sword. The Pink Delta Runner forms the left arm, and has a panel that flips up. On the Japanese version of the toy, this panel revealed a badge. The badge is absent from the USA version of the toy, making this panel useless. Transformation to the Megazord is probably the easiest of any Megazord to date, making it suitable for younger children. When the power is on, attaching a limb to the body results in a metallic "klang" noise. This is a very cool feature. Once in Megazord mode you can activate the light and sound features by pressing the button on Red Delta Runner. There are a few different light and sound patterns, so be sure to try them all. The Megazord is made out of a high quality plastic, with absolutely no metal content. It's smaller than you'd expect; a full head smaller than the Dino Thunder Megazords. The Delta Squad Megazord is exceptionally sturdy - you don't have to worry about breaking anything. It has a good, solid feel to it; very toy-like. You can remove the shoulder of the Yellow Delta Runner and combine it with the blade stored in the Green Delta Runner to form the Judgment Sword. You can also remove the Wings from the Blue Delta Runner to form giant handcuffs. The handcuffs and sword can attach to the rear wheels of the Red Delta Runner in vehicle mode as well. Lack of silver paint. The only vehicle to get silver paint was the Red Delta Runner. Paint detail is missing from all the other vehicles. The US version is missing chrome from behind the lights. In the Japanese version, there is a chrome panel behind the translucent red, so when the lights are activated you get a more dynamic look. These were left out of the USA release. a little shorter than the Japanese version, probably for safety concerns. The badges are missing from the Pink Delta Runner. On the Japanese version, you flip the panel on the roof up and there is a slot where you can put an assortment of badges. Surprisingly, all these things do not make it a bad toy. I have a few small complaints, but nothing that really ruins it. Bandai did away with the nice window-box packaging. In vehicle mode, the Red Delta Runner has two protruding pegs sticking out of the rear wheels which look a bit awkward. The joint between the trailer and cab on the Green Delta Runner really isn't much of a joint, and doesn't allow a wide range of movement. It's kind of small for the $39.99 price tag. All in all, I really like this toy. For extra added play value, you can take Zords from some of the previous Power Ranger series and use them with this set, as they share a common connection mechanism for the arms. 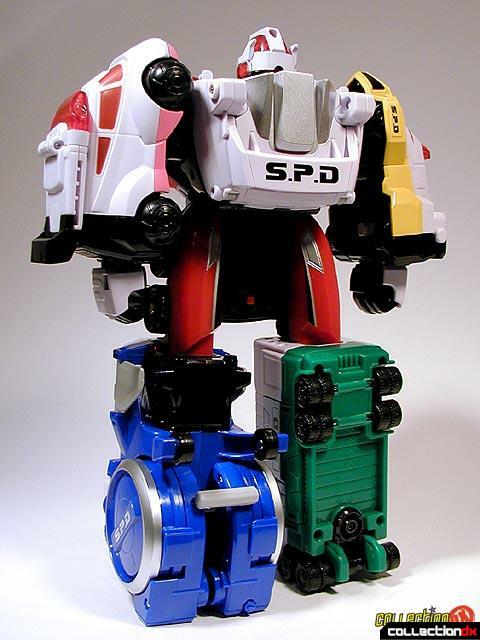 You can take Wild Force Megazord arms and add them to your SPD Megazord. How cool is that? 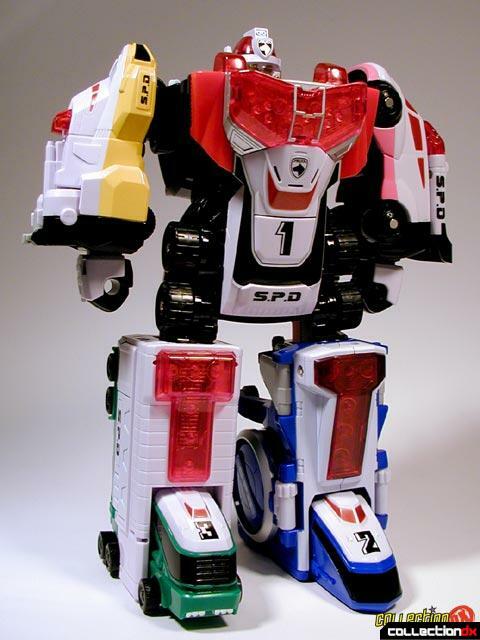 One of my main gripes was that the SPD Delta Megazord did not include the badges that came with the Japanese version. Well, click on the image below to see a full size version, that you can save to your hard drive and print out. Make sure to measure the space on the pink verhicle so your badges will fit properly!